Today Walt Disney World president George Kalogridis announced a new daytime parade is on the way next year for the Magic Kingdom. 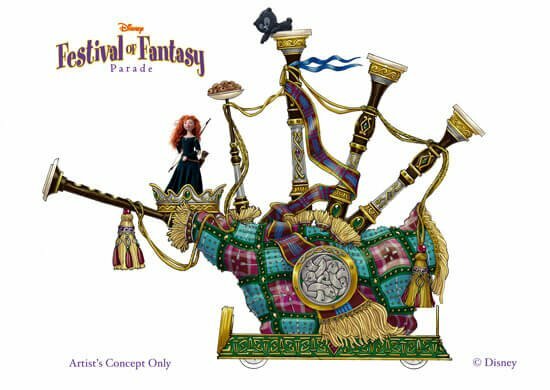 The Disney Festival of Fantasy Parade will debut in spring 2014 bringing the stories of New Fantasyland throughout the park with all-new parade floats, costumes, and an original soundtrack featuring songs from favorite Disney films – and a new parade theme song. Featured stories and characters will be from “The Little Mermaid,” “Sleeping Beauty,” “Dumbo,” “Pinocchio,” “Peter Pan,” “Tangled” and “Brave,” among others. Festival of Fantasy will replace the Celebrate a Dream Come True Parade, which has run under various incarnations since 2001. When it debuts, it will be the first all-new daytime parade for the Magic Kingdom in 13 years. Celebrate a Dream Come True will have its finale performances January 1-4, 2014. Very much long overdue. How many parades has disneyland gone through non the past 13 years? Lol. Next in line for wdw should be some attraction announcements lol. A man can dream right? 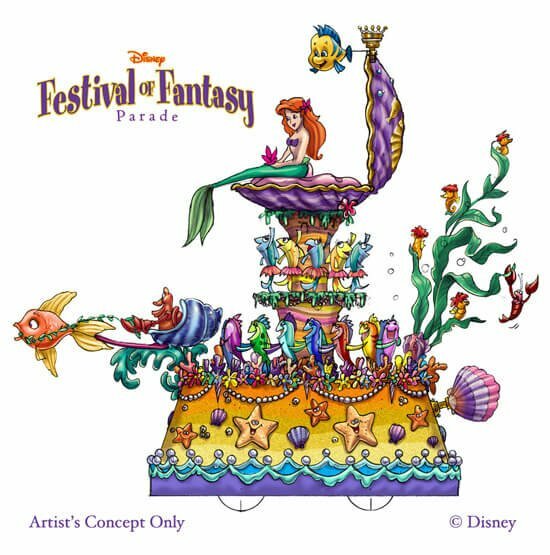 I really like the concept art for these floats. I’m not a parade person, but I think I may have to watch this one! I still think that they should have a Frozen float, though. The Brave float looks……….odd. I get its a bagpipe but……yeah just odd. Do we know if Mark Hammond, who did Soundsational, will be doing the music for this parade? I really hope so! This Parade Looks Horrible. It Is Still Another DAY TIME Parade, not A NIGHTTIME Parade! Like The Former Spectromagic Disney Destroyed! Another Boring daytime Parade. Good Grief! This parade sure is magical! I cant believe how amazing disney is it is unbelievable! I cant wait to go and see it! But, this is a Daytime Parade….What made the Parade of Lights so unique was all the lights. Disappointed… Who wants to stand in the Heat in Main Street, Sun beating down on you and the kids?